The myth regarding Perseus is perhaps the oldest and best known of all Greek myths. 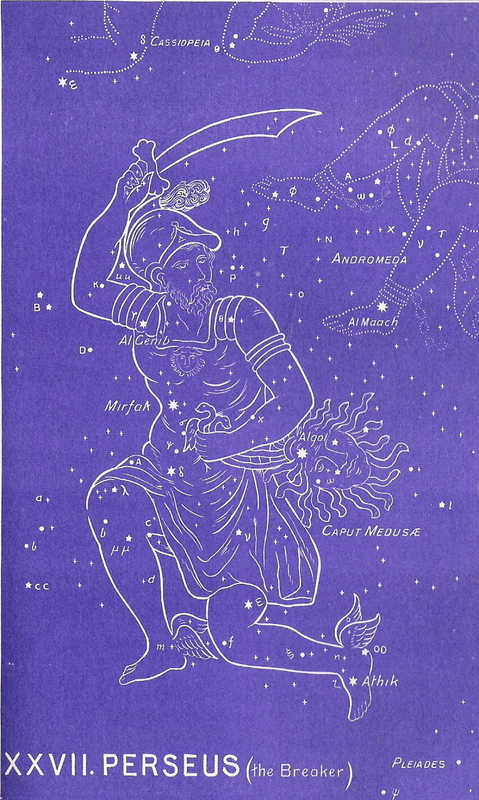 Perseus, the son of Jupiter and Danae, is abused along with his mother by his cruel grandfather, Acrisius. They are cast out to sea but then rescued by some fishermen who take them to Polydectes, King of Seriphus. He adopts the boy and makes him a favorite son . Eventually, Perseus seeks out and destroys the terrible Medusa. Here is a story of bravery, treachery, love, and rescue — everything that a good story needs!The truth is that this ancient fable foreshadows the gospel of Jesus Christ. It is nothing less than the story of our Lord’s love for us and of our amazing deliverance by His power and grace. We have finally arrived at the last decan of the last sign in this Book Two of the star revelation. Remember that this whole second book has been revealing to us the blessings of our union with Christ through faith — and not just in the future eternity — but now, here on Earth. And this last sign (Aries) has focused on the fulfillment of Christ’s promises to the believers. And so, we finally see the most vivid picture of the “blessed hope” that we have as believers, the return of Jesus Christ. The other two decans of Aries (Cassiopeia and Cetus) have also given us a vivid picture of our future — but HERE, in Perseus, we see our Savior returning. It’s a great way to end Book Two Here is a warrior returning from His victories, carrying the head of his defeated and ruined enemy. This figure is very interesting. Here is a warrior. Note that in his right hand, he holds a sword aloft. It is the sword used to kill the dreaded Medusa, whose head he holds in his left hand. Also notice that his feet have wings! Here is an unquestioning ancient kernel of the truth, long since forgotten as to its real meaning. He will descend from heaven — in the air! — to take up His beloved Bride to be forevermore with Him there. The promised deliverance of the beloved Bride is the theme of the greatest message ever to come to mankind — the “Blessed Hope” of the return of Jesus Christ. In Perseus, we see the climax to the chapter of fulfillment. Here is the Lord Jesus come in glory with power to break the bands of the enemy. Was we seen in the sign, Aries, is the fact that te coming of Jesus is both the happiest and most terrible even of all history. For those who have trusted Him, it is joy beyond expression. For those who have rejected Him, is is terror equally inexpressible. Perseus shows that truth — that terror will come to those who have outraged His holiness. He is coming with power to set all things right! Pay careful attention to the meanings of the star names. They will always back up the message of The Gospel Truth above. To continue in the correct order of the ancient star chart, please select Taurus next. Also, be sure to download your Free e-bookthat discusses the historical, cultural, and biblical evidences for this amazing star revelation.